In another example of punching above its weight, Ireland has retained a "Top Ten" ranking on the Global Innovation Index 2013, a survey of 142 countries just released by the World Intellectual Property Organization (WIPO) and Cornell University. The United States rejoined the five most-innovative nations and the United Kingdom moved up to the third spot while Switzerland retained its place atop the rankings. Singapore dropped from third in 2012 to eighth this year and Ireland did drop from ninth to tenth, the spot previously occupied by the US. However, GII 2013 organizers did say the shuffling of leader board was due more to changes in their own methodology than to changes in the countries' level of innovation. 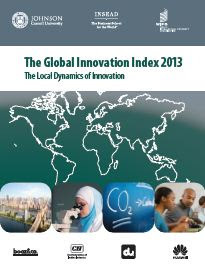 Earlier this year Ireland was ranked twelfth on the Bloomberg Global Innovation Index. Membership in the GII 2013 top 25 countries also remained unchanged. The study also pointed out the following nations that were out-innovating their peers: The Republic of Moldova, China, India, Uganda, Armenia, Viet Nam, Malaysia, Jordan, Mongolia, Mali, Kenya, Senegal, Hungary, Georgia, Montenegro, Costa Rica, Tajikistan and Latvia).